WHY CHOOSE US FOR YOUR MINI DENTAL IMPLANTS? Our caring staff is specially trained to assist with your mini implant treatment. Because this is a focus of our practice, our staff members are experienced with all aspects of implant treatment, and often continue their education through special doctor and staff training programs. This state of the art facility contains the most modern equipment available to deliver these specialized services, and meets or exceeds the highest quality standards of safety and infection control. Thousands of mini dental implants have been placed and studies demonstrate a success rate greater than 95% when provided by properly trained and experienced dentists. Ask our dentist if you are a candidate for these procedures today. The mini dental implant procedure is a much less involved process than the conventional dental implants. For this reason, the procedure can usually be completed in one simple dental appointment. In addition to saving time in the dental office, you will have far less discomfort following this procedure due to the minimally involved dental procedure (usually requiring no surgical flaps or sutures). Because the mini dental implants are so time efficient, your dentist is able to perform these procedures at a fraction of the cost associated with the larger conventional dental implants. 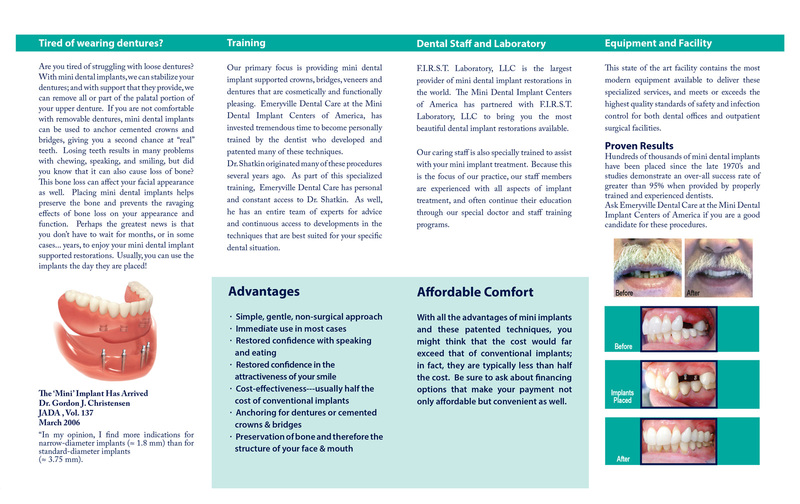 STABILIZE YOUR LOOSE DENTURES IN ONE VISIT! Imagine smiling, eating and speaking with confidence and comfort again! Our dentist and caring staff will listen to you and develop a plan to reach your goals. You can get started on your very first visit with all the necessary x-rays and impressions. Why wait? Turn your dreams of a more comfortable and attractive smile into a beautiful reality! 1. Your denture is fabricated as a normal denture. 2. Four or more implants are placed in one visit. The procedure requires only a few drops of local anesthesia. Each implant is placed quickly and easily. Your denture is then retro-fitted to snap on the mini implant retention heads. The mini implant system requires no extensive surgery, and with some care are ready for immediate use. 3. Laugh, smile, and speak with confidence and comfort. REPLACE YOUR MISSING TEETH THE SAME DAY! Mini dental implants have been used for many years to hold denture plates in position, providing patients with the ability to eat, smile, and speak with comfort and confidence. Today, use of this non-surgical mini dental implant technology has been expanded for anything from replacing a single tooth to full mouth restoration. Thousands of implants have been placed with over a 95% success rate using these cost effective procedures. The entire process consists of a consultation visit to your dentist with x-rays and impressions being taken. Then, at one treatment visit, your officially trained dentist will place the mini implant(s). In about 30 minutes, a single tooth can be replaced without the need to grind down healthy tooth enamel. You can walk out ready to enjoy the foods you wish, without the long healing times and high costs associated with conventional implants. This same procedure can be used to replace multiple missing teeth usually in about an hour. 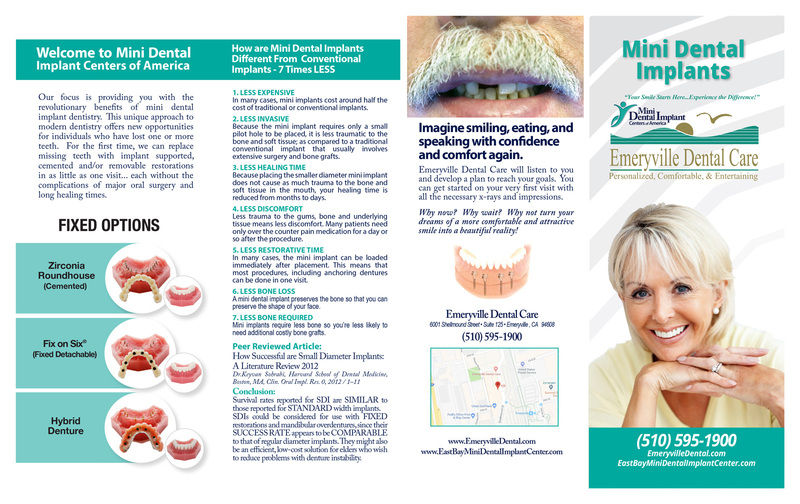 MINI DENTAL IMPLANTS CAN CHANGE YOUR LIFE! If you have loose dentures, single or multiple missing teeth, then mini dental implants may be the solution for you! You can leave with a beautiful smile in as many as two office visits!